Social learning theory focuses on the learning that occurs within a social context. It considers that people learn from one another, including such concepts as observational learning, imitation, and modeling. Among others Albert Bandura is considered the leading proponent of this theory. 1. People can learn by observing the behavior is of others and the outcomes of those behaviors. 2. Learning can occur without a change in behavior. Behaviorists say that learning has to be represented by a permanent change in behavior, in contrast social learning theorists say that because people can learn through observation alone, their learning may not necessarily be shown in their performance. Learning may or may not result in a behavior change. 3. Cognition plays a role in learning. Over the last 30 years social learning theory has become increasingly cognitive in its interpretation of human learning. Awareness and expectations of future reinforcements or punishments can have a major effect on the behaviors that people exhibit. 4. Social learning theory can be considered a bridge or a transition between behaviorist learning theories and cognitive learning theories. People are often reinforced for modeling the behavior of others. Bandura suggested that the environment also reinforces modeling. 1, The observer is reinforced by the model. For example a student who changes dress to fit in with a certain group of students has a strong likelihood of being accepted and thus reinforced by that group. 2. The observer is reinforced by a third person. The observer might be modeling the actions of someone else, for example, an outstanding class leader or student. The teacher notices this and compliments and praises the observer for modeling such behavior thus reinforcing that behavior. 3. The imitated behavior itself leads to reinforcing consequences. Many behaviors that we learn from others produce satisfying or reinforcing results. For example, a student in my multimedia class could observe how the extra work a classmate does is fun. This student in turn would do the same extra work and also receive enjoyment. 4. Consequences of the model's behavior affect the observers behavior vicariously. This is known as vicarious reinforcement. This is where in the model is reinforced for a response and then the observer shows an increase in that same response. Bandura illustrated this by having students watch a film of a model hitting a inflated clown doll. One group of children saw the model being praised for such action. Without being reinforced, the group of children began to also hit the doll . 1. Contemporary theory proposes that both reinforcement and punishment have indirect effects on learning. They are not the sole or main cause. 2. Reinforcement and punishment influence the extent to which an individual exhibits a behavior that has been learned. 3. The expecfation of reinforcement influences cognitive processes that promote learning. Therefore attention pays a critical role in learning. And attention is influenced by the expectation of reinforcement. An example would be, where the teacher tells a group of students that what they will study next is not on the test. Students will not pay attention, because they do not expect to know the information for a test. Many behaviors can be learned, at least partly, through modeling. Examples that can be cited are, students can watch parents read, students can watch the demonstrations of mathematics problems, or seen someone acting bravely and a fearful situation. Aggression can be learned through models. Much research indicate that children become more aggressive when they observed aggressive or violent models. Moral thinking and moral behavior are influenced by observation and modeling. This includes moral judgments regarding right and wrong which can in part, develop through modeling. 1. Modeling teaches new behaviors. 2. Modeling influences the frequency of previously learned behaviors. 3. Modeling may encourage previously forbidden behaviors. 4. Modeling increases the frequency of similar behaviors. For example a student might see a friend excel in basketball and he tries to excel in football because he is not tall enough for basketball. 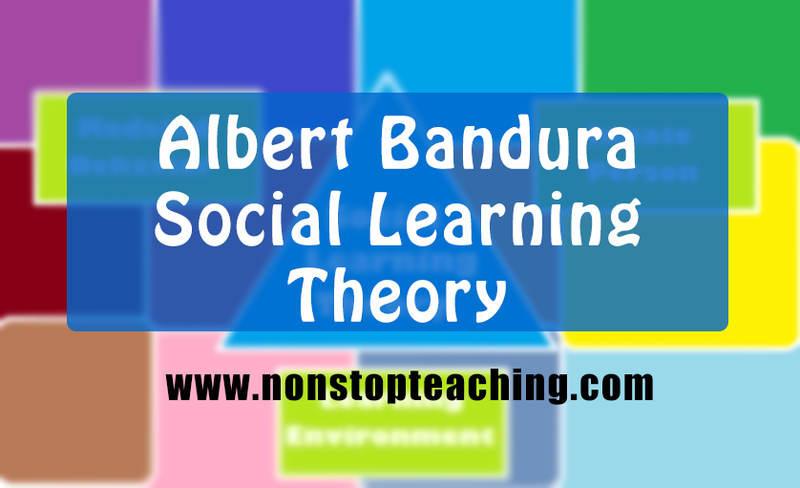 Social learning theory has numerous implications for classroom use. 1. Students often learn a great deal simply by observing other people. 2. Describing the consequences of behavior is can effectively increase the appropriate behaviors and decrease inappropriate ones. This can involve discussing with learners about the rewards and consequences of various behaviors. 3. Modeling provides an alternative to shaping for teaching new behaviors. Instead of using shaping, which is operant conditioning, modeling can provide a faster, more efficient means for teaching new behavior. To promote effective modeling a teacher must make sure that the four essential conditions exist; attention, retention , motor reproduction, and motivation. 4. Teachers and parents must model appropriate behaviors and take care that they do not model inappropriate behaviors. 5. Teachers should expose students to a variety of other models. This technique is especially important to break down traditional stereotypes. 6. Students must believe that they are capable of accomplishing school tasks. Thus it is very important to develop a sense of selfeflicacy for students. Teachers can promote such self-efficacy by having students receive confidence-building messages, watch others be successful, and experience success on their own. .
7. Teachers should help students set realistic expectations for their academic accomplishments. In general in my class that means making sure that expectations are not set too low. I want to realistically challenge my students. However, sometimes the task is beyond a student's ability, example would be the cancer group. 8. Self-regulation techniques provide an effective method for improving student behavior. Observational learning, also called social learning theory, occurs when an observer's behavior changes after viewing the behavior of a model. An observer's behavior can be affected by the positive or negative consequences-called vicarious reinforcement or vicarious punishment - of a model's behavior. 2. The observer will react to the way the model is treated and mimic the model's behavior. When the mddel's behavior is rewarded, the observer is more likely to reproduce the rewarded behavior. When the model is punished, an example of vicarious punishment, the observer is less likely to reproduce the same behavior. 3. A distinction exists between an observer's "acquiring" a behavior and "performing" a behavior. Through observation, the observer can acquire the behavior without performing it. The observer may then later, in situations where there is an incentive to do so, display the behavior. 4. Learning by observation involves four separate processes: attention, retention, production and motivation. - Attention: Observers cannot learn unless they pay attention to what's happening around them. This process is influenced by characteristics of the model, such as how much one likes or identifies with the model, and by characteristics of the observer, such as the observer's expectations or level of emotional arousal. - Retention: Observers must not only recognize the observed behavior but also remember it at some later time. This process depends on the observer's ability to code or structure the information in an easily remembered form or to mentally or physically rehearse the model's actions. - Production: Observers must be physically and/intellectually capable of producing the act. In many cases the observer possesses the necessary responses. But sometimes, reproducing the model's actions may involve skills the obseryer has not yet acqufued. It is one thing to carefully watch a circus juggler, but it is quite another to go home and repeat those acts. - Motivation: In general, observers will perform the act only if they have some motivation or reason to do so. The presence of reinforcement or punishment, either to the model or directly to the observer, becomes most important in this process. 5. Attention and retention account for acquisition or learning of a model's behavior; production and motivation control the performance. 6. Human development reflects the complex interaction of the person, the person's behavior, and the environment. The relationship between these elements is called reciprocal determinism.A person's cognitive abilities, physical characteristics, personality, beliefs, attitudes, and so on influence both his or her behavior and environment. These influences are reciprocal, however. A person's behavior can affect his feelings about himself and his attitudes and beliefs about others. Likewise, much of what a person knows comes from environmental resources such as television, parents, and books. Environment also affects behavior: what a person observes can powerfully influence what he does. But a person's behavior also contributes to his environment. "Observational Learning." Funderstanding: Education and Training for Active Learners. Web. 19 Oct. 2010. Bandura, Albert. Social Learning Theory. Englewood Cliffs, NJ: Prentice Hall,1977. Bandura, Albert. "The Role of Modeling Processes in Personality Development." National Association for the Education of Young Children ( 1976): 42-58. Print.